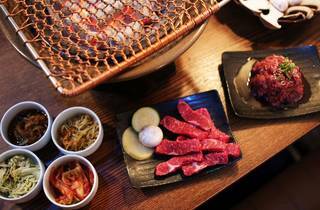 What’s the best thing about Korean barbecue? Well, that would be the banchan. Basically it’s all the free stuff that lands on your table right before you kick things off with the coals. It’s the kimchi, the radish, the salads and soups. If you don’t have Korean heritage, you’re probably not going to know what most of these things are, but the prodding and tasting is half the fun. 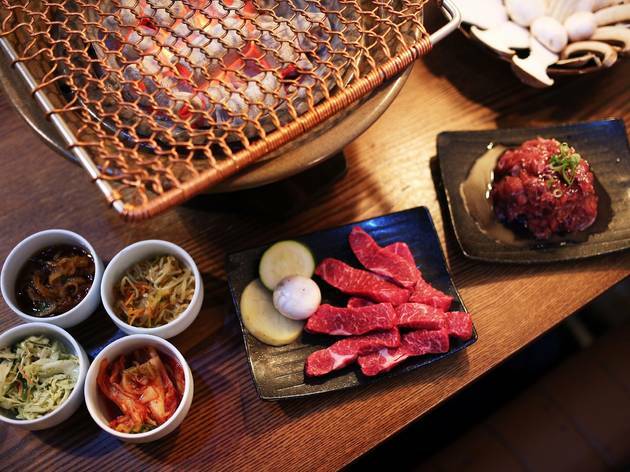 At 678 Korean BBQ in the CBD, we count no fewer than nine banchan: there’s kimchi and hot sweet potato, pickled radish and some seriously delicious fermented chilli sauce, among other plates. They land at lightening speed on our table as soon as we sit down. It’s a bit like that at this place: all the staff in the vast, wooden-themed space seem to rush about faster than you can catch them. When you do, though, order the pork belly and the marinated boneless short rib for your tabletop barbecue, and you can get down to cooking. You have to cook the pork belly for a while; leave it on and let it char up a little. Same goes for the short ribs, which need some time on the grill (this is when poking and sampling the banchan comes in handy). When you let them grill for a bit, the pork develops a nice caramelised outer layer, while inside it stays soft and juicy. The sugars in the beef marinade also respond well to charring; you’ll know the meat isn’t cooked well enough if you have to use your canines to tear it apart. Just pop them back on and they will soften up to melting tenderness: trust us. But if that all sounds like too much hard work for a dinner date, then get the wagyu ribeye fillet instead, which cooks quickly and has good flavour. For us, though, it’s all about the rougher cuts, whose intense flavour is just incomparable. We go for a platter of extra vegetables, from which the enoki mushrooms turn out especially delicious, softening on the grill and taking on all the caramelised flavours of the meat that was there before them. A spicy tofu stew turns out to be full of seafood, so avoid that if you’re veggie (or, God forbid, allergic). To wash it all down, the Cheoeum Cheoreom soju is strong and boisterous, or a Hite Korean beer will keep things on the light and bright side (and what Sydneysider should be barbecuing without a beer in their hand?). Sure, cooking your own food isn’t for everyone, but the offerings here are good and solid, and the kimchi in particular has a beautiful, authentic umami kick. It’s damn noisy, so don’t go here for a heart-to-heart. But for a good time with tasty eats city-side, we’re definitely on board.